A few short years before the ground broke for Penn Station, construction was underway in Herald Square for a retailer new to the city: Saks. 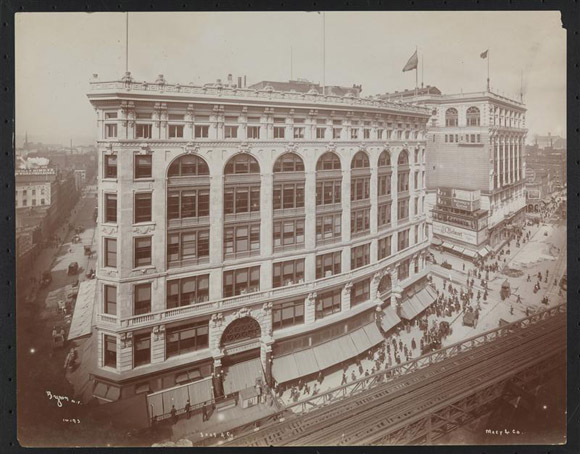 The company, founded by Baltimore merchant Andrew Saks, chose Herald Square as the location for its first New York store in part because of its proximity to the Sixth Avenue elevated train and rumored Penn Station. Along with Macy's and a little later, Gimbels, these major stores would soon redefine Herald Square as a retail hub of the city. The Saks building was designed by architecture firm Buchman & Fox, the same firm that would later design the World's Tower building on West 40th Street. Though Saks and Macy's were more or less neck and neck with their store construction and opening announcements, Saks still managed to open its doors just five weeks before Macy's in 1902. Unlike Macy's, a store composed of several departments, Saks in the early 1900s sold only clothing, making it not quite a true department store. Around the same time, one avenue over, Benjamin Altman was purchasing lots on Fifth and 34th to build his new store B. Altman & Co.
Saks and Macy's coexisted, offering consumers slightly different inventories -- Saks was an upscale clothing-based retailer, and Macy's catered to the general consumer with a large variety of merchandise-- until 1909, when another large retailer, Gimbels, joined the fray. Founded by Adam Gimbel in Vincennes, Indiana, Gimbels built its first large store in Philadelphia, PA, before constructing a New York branch just one block south of the Saks store, on Sixth Avenue between 32nd and 33rd Streets. Three large department stores in a row + public transportation = retail district. Similar to Macy's, Gimbels was a large department store and family business. Adam Gimbel had several sons, many of whom worked for the Gimbels Company: Isaac Gimbel became President in 1894, and was the driving force behind the store's expansion to the New York market; that same year, Ellis Gimbel took over Public Relations and advertising for the company. In 1921, he started the first Thanksgiving Parade in Philadelphia, PA, three years before Macy's began its iconic parade in New York City. The company purchased Saks in 1923, and one year later, created the Saks Fifth Avenue brand, and opened its first store. The 34th Street location was kept open, and the Saks 34th brand was created. High end retail was moving farther north along Fifth Avenue, and the building's out-of-date construction (it didn't have escalators) were key factors in the decision to close the store in 1965. In 1967, discount retailer Korvette's moved into the Saks building. They "modernized" the facade, as seen below. Founded in 1947 by Eugene Ferkauf in a small store on Fifth Avenue and West 47th Street, Korvette's expanded quickly, with 2,684 stores in operation by the mid-1960s. This decade also saw a general rise in the national presence of discount retailers. Gimbels stayed open until 1986. When it finally closed, it was cited as the store with the largest shoplifting rate of any in the country, largely because of the Gimbels Corridor. Originally built as a convenience to shoppers, the underground passageway connected the store to Penn Station a couple blocks away, and provided shoplifters with an easy escape. By the 1970s, the corridor had a horrible reputation and was the scene of more than a few gruesome crimes. This very opinionated description from a NY Post article pretty much sums it up: "In the midst of teeming Midtown, bare-bulb fixtures like those in mines marked a path through a Calcutta-like sprawl of diseased, predatory humanity." After Gimbels closed, the building was renovated, and in 1989, reopened as A&S Plaza, and is now the home of JC Penney and the Manhattan Mall. Next door, the Saks building, now the Herald Center Mall, is slated for yet another makeover.